Meal prep. There are so many ways to do it: chicken meal prep, budget-friendly meal prep, easy meal prep…the list goes on and on. Over the past seven months, I’ve lived a meal prep lifestyle. Honestly, there are good things about meal prep, and there are not so good things about meal prep. Coming home from a stressful day of work and grabbing an already prepared (healthy) meal is a huge advantage. Less time in the kitchen during work days is a big-time plus. However, a downside can be falling into patterns and changing eating habits can be a bit of a shock to the system. Over the next few weeks, I’m going to share the highs and lows of my meal prep experience. I’ll share with you why I decided to start, some results and some of my favorite, and not so favorite meal prep ideas. 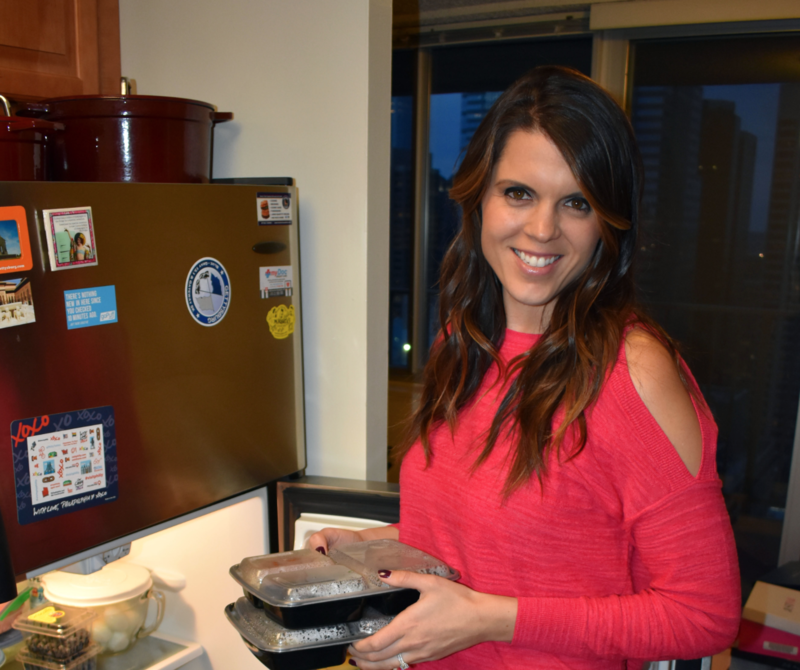 I look forward to hearing your feedback on these blogs and welcome any go-to meal prep ideas you have. Have you ever been in the following situation? You’re at your favorite lunch spot and you order the “healthy” salad instead of the fries. Feeling good, right? Ten minutes later, you’re two fork scoops away from seeing the bottom of a very large bowl. You ate the whole thing. The two cups of salad dressing, cheese, bacon, candied nuts, croutons…umm, check, please! Don’t worry, we’ve all been there – I’ve been there. In the past, I’ve ordered the whole chicken with a side of veggies and found myself eating the whole thing. Ordering this massive meal from the waiter seemed like a good idea; however, I’m second guessing my choices as the same waiter is dropping off the check. All this eating made me think about a few things. Am I overeating? Am I fueling my body with the right foods to help me achieve my goals? Back in college, I could eat anything I wanted. My metabolism had a lot to do with it, but I also played volleyball and found myself working out or at practice for four to six hours a day. So, what happened? A few years ago, I became a serious runner. I would run up to 10 miles a week when training for a half-marathon. In between runs, I would go to the gym and mix up weight training with some HIIT workouts. But, I was not seeing any results in my weight or my physique. What gives??? I wondered why I wasn’t seeing a huge impact after hours and hours in the gym. After some research and help from a few friends, portion control was the culprit. It had to be. So, I found myself at a crossroads of fixing my eating habits. Not necessarily eliminating anything, because I never ate “bad” per-se, just breaking meals in half or thirds. I was on a mission to find the plan that worked for me. I thought that if I worked out enough then I could eat whatever I wanted to; however, that is not the case. It holds true that weight loss and seeing ultimate results starts in the kitchen. Remember the 80/20 rule: 80 percent of weight control is in the kitchen. No matter how hard you train, you’ll never see true results if you are fueling your body with too much fuel. I never really understood that concept until I started the 21-Day Fix Container Guide which I learned about from my friends while on vacation (thank you Ali and Nick). Have you spent hours, days, weeks, years, decades in the gym only to see zero results? Check out my next blog on how I stopped plateauing and started winning in the kitchen. 3rd Half Marathon In The Books!